"This is a great veggie recipe that can be eaten as a meal or prepared for an appetizer. Even my meat and potatoes husband enjoys it." In a heavy saucepan over high heat, bring water to a boil with salt and pepper. Slowly pour in cornmeal, stirring constantly with a wooden spoon. Reduce heat to low and cook 20 minutes, stirring frequently as the mixture thickens. Using a wet spatula spoon the cornmeal mixture (polenta) 1/2 inch thick onto a sheet of wax paper. Set aside to cool. Preheat oven to broil. Lightly grease a baking sheet. Heat oil in a large skillet over high heat. Cook mushrooms, onion, garlic and herbs in the hot oil until mushrooms are tender. 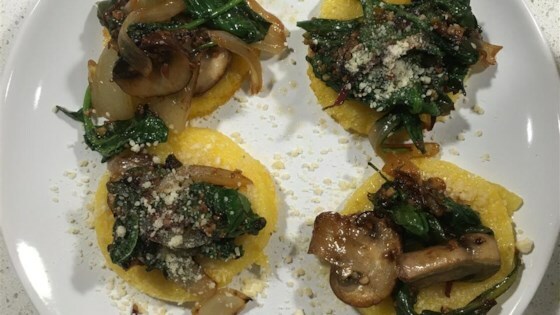 Cut cooled polenta into squares and place on prepared baking sheet. Broil until browned on both sides. Serve with mushroom sauce. I agree - the recipe as written is bland. I added some feta cheese which helped but I would not make it again. THE MUSHROOM TOPPING WAS BLAND, NOT KEEPING THIS ONE.